I got my incense making supplies today and am in the process of making some incense. It seems pretty easy to make, we'll see how it comes out. 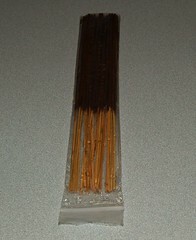 I'm starting off with some cherry vanilla sandalwood incense. It should be ready in a few days. Need to let it soak in oils for about 24 hours then dry for a few days. My next project will be lip balm! Thinking about taking a trip to Zenith in Seattle to pick up a few supplies. Maybe check out the new Sculpture Park while I'm in the area.